Looking for a homemade version of Ajax or Comet (minus the harsh bleach)? This morning my son and I whipped up a container of our own version of powdered cleanser in about 15 minutes. Combine salt, borax, washing soda, and baking soda in a container with at least a 2 cup capacity. If you will be adding an essential oil, grind the reserved 1 tablespoon baking soda with 5-10 drops essential oil in a mortar and pestle, and then add to the rest of the mixture. Shake well to combine. To use: Dampen surface you wish to clean. Sprinkle cleanser over surface; allow to sit for a couple minutes if desired. Scrub cleanser into surface with a sponge until clean. Rinse cleanser off with water. This cleaner should be safe to use on most hard surfaces, including stainless steel, porcelain, ceramic, or plastic. If you are in doubt about whether or not to use the cleaner on a surface, test a small, inconspicuous area first. I used an old Parmesan cheese container to put my cleaner in--it's perfect since it has the shaker holes at the top. If you don't have a Parmesan cheese container, perhaps you could try a large spice container, or follow the directions here to make a shaker using a mason jar. We tested the cleaner on our kitchen sink right after we made it, and I was very pleased with the results. There were several rust spots in the sink from a steel wool pad, and the cleanser tidied them right up. My only recommendation would be to wear gloves if you have an open cut on your hand--the salt will sting it. Cost-wise, the entire 2 cup batch only cost me around 96¢ to make--not to shabby! That comes out to only 6¢ an ounce, which is several cents cheaper per ounce than anything you'd buy in a store. So, not only is it cheap, but it is fast and easy to make, and cleans wonderfully. Go ahead and whip some up! Love this recipe so far, I used Wild Orange Essential Oil!!! Scrubbing away. Question for you. 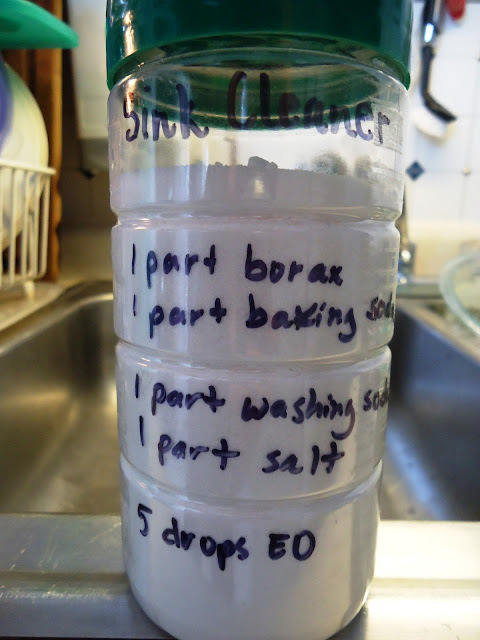 Several other recipes I found for DIY cleansing powder included adding 1/2 cup of ascorbic acid. I usually see it used for anti-caking. Any thoughts on adding this one way or the other? Not sure if there would be an additional cleaning power. Thanks in advance. Hi Debi, I have tried using ascorbic acid in the dishwasher as a rinsing agent before, but never in this context before. I think it could be worth a try though, because it is supposed to remove water deposits.